February 6, Mt. 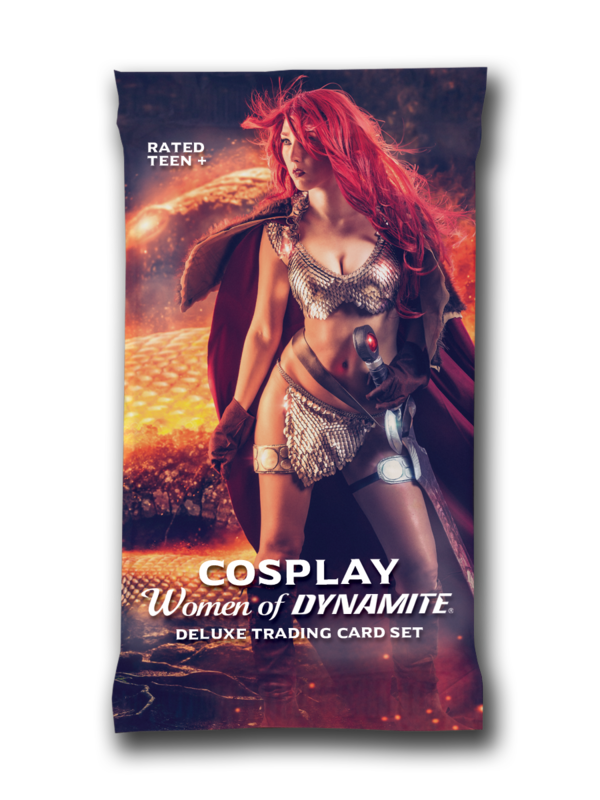 Laurel, NJ: Dynamite Entertainment announces a Kickstarter for the Cosplay Women of Dynamite Deluxe Ultra-Premium Trading Cards. 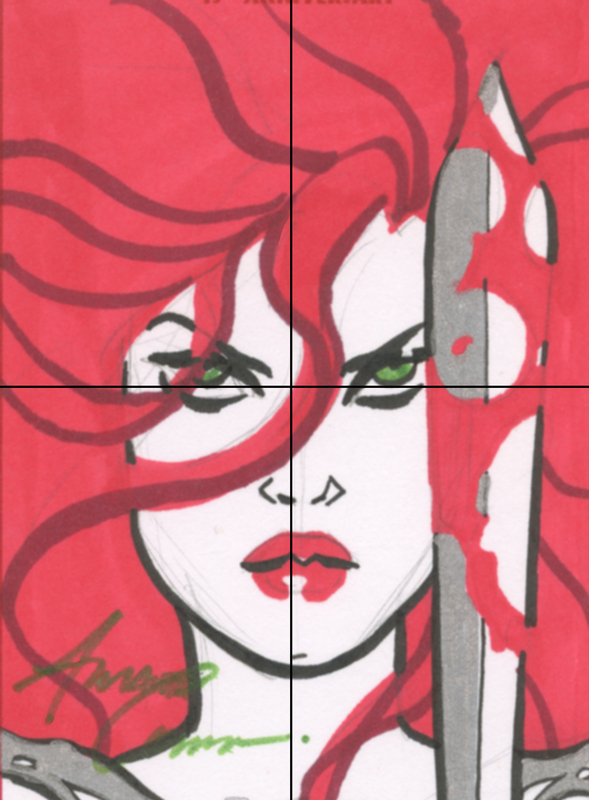 Adorers of fun cosplay covers and sketch card fanatics can check out the campaign for advance deals on packs and boxes, including one-of-a-kind sketch cards and other bonuses! For as long as comic books have been published, there have been super fans. Some of those fans have expressed their love for the medium and characters by spending countless hours and dollars hand crafting intricate replica costumes. Sometimes to only wear them once! Over the years, some comic book publishers have worked with these talented artists to bring their vision to readers. Dynamite is the leading publisher of cosplay comic book covers and is proud to work with so many talented costume artists, models and photographers. 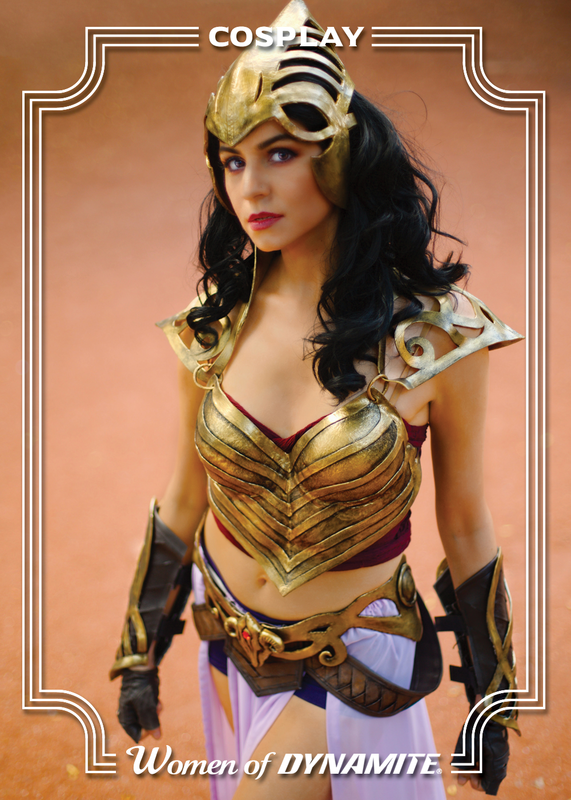 Fans can find characters including Red Sonja, Vampirella, Dejah Thoris, Sheena and more portrayed by the most popular and talented cosplayers today. Vera Bambi, Cervena Fox, Karrigan Taylor, Ireland Reid, Joanie Brosas, Ashley Du, Jacqueline Goehner, Tatiana Neva, Tabitha Lyons (Artyfakes) and so many more have graced the covers of Dynamite comics. The art of cosplay is in fact steeped into the DNA of Dynamite's flagship heroines. 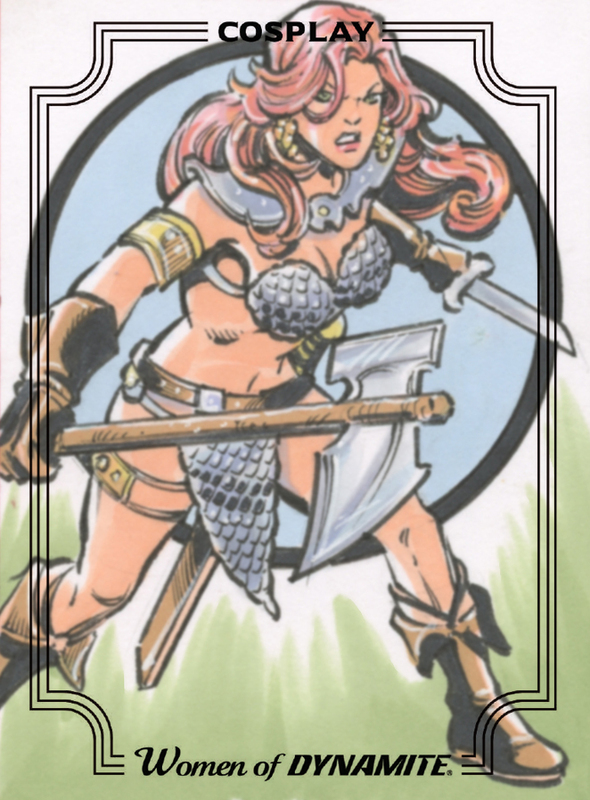 In the 1970s signature Red Sonja artist Frank Thorne used his "The Wizard" persona to judge Sonja look-a-like contests at some of the earliest comic conventions. Wendy Pini, writer/artist and creator of the indie classic Elfquest, was among the most acclaimed early Sonja cosplayers. Actress Barbara Leigh made history in 1978 as the first woman to dress up as Vampirella professionally, gracing the cover of Warren's Vampirella #67 and several subsequent issues. During the Harris years, memorable models including Sascha Knopf, Julie Strain, Maria Di Angelis and Kitana Baker continued this tradition. Dynamite's cream of the crop sketch card artists in this set include Axe, Ken Haeser, Kevin Graham, Mike Lilly, Mitch Ballard, Rich Molinelli, Sanna U, Tim Shay and tons more! Entry level fans looking for a deal have a few great options. At just $5 fans can get digital copies of four fabulous recent cosplay featuring first issues! Including Red Sonja Vol 4 #1 by Amy Chu & Carlos Gomez, Vampirella Vol 4 #1 by Paul Cornell & Jimmy Broxton, Sheena #1 by Marguerite Bennett, Christina Trujillo & Moritat and Vampirella/Dejah Thoris #1 by Erik Burnham & Ediano Silva. At just $10 backers can snag up a huge digital graphic novel, detailed below. Then for $15 backers can get a set of four of the set's signed cards featuring cosplayers Ireland Reid, Joanie Brosas, Valerie Perez and Shannon Kingston! Another reward tier option for supporters at just $30 is the graphic novel Swords of Sorrow: The Complete Saga, the crossover epic orchestrated by Gail Simone and a whole team of female writers. All of fans' favorite Dynamite heroines across time and space came together to save their worlds. This titanic tome is over 500 pages, includes a gallery of all 55 covers and would normally cost $50. Backers who preorder two foil packs or more will be able to choose among a selection of top tier artists to produce exclusive one-of-a-kind sketch cards just for them. Supporters at this level also get access to high quality prints of these stunning cosplay images! Also available are various, one-of-a-kind sketch card puzzle sets of 4,6 and 9 cards. Super fans can consider going all in on higher reward tiers for a full bag of loot. Which can include two full boxes (24 packs), two promo cards, a 9 card puzzle set, the ability to choose their own sketch artists and most exclusive of all - an uncut factory card sheet! The ultimate rare collectible for card collectors. Plus a limited edition sketch card from superstar Sanna U! At any reward tier, stack on $140 for a discounted Women of Dynamite Vampirella statue. This stunning piece is sculpted by Jason Smith based on the incomparable art of J. Scott Campbell.